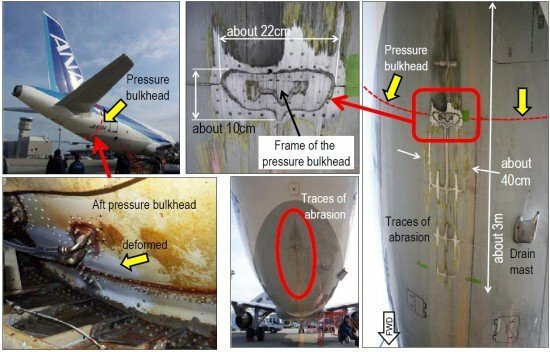 An Airbus A320 suffered a tailstrike when the captain initiated a go-around from a full-aft sidestick position while landing at Sendai Airport, according to an investigation report released by the Japan Transport Safety Board (JTSB) . On February 5, 2012, All Nippon flight 731 departed Osaka-Itami International Airport (ITM), Japan, on a domestic service to Sendai (SDJ). The captain was Pilot Flying. JTSB reports that the en route part of the flight was uneventful and the weather at Sendai was fine. Wind was reported from 160 degrees at 2 knots as the A320 was flying a visual approach to runway 27. At 09:03:04 the aircraft passed the runway threshold at a height of 50 feet and the captain felt the airplane floated. The right hand main landing gear touched down softly at 09:03:14. Four seconds later the captain pulled the reverse levers. Almost at the same time, he felt some vibrations from the airframe like stall buffeting and thought that it was not a normal landing. Determining that the aircraft was still in the air, the captain decided to go around, shifting the thrust levers to TO/GA positions. The nose was raised sharply, reaching +12.7 degrees. The tail struck the runway, causing a 40 cm * 3 m gash and a distorted rear bulkhead. The airplane circled and landed safely at 09:27. There were no injuries among the 166 passengers and crew. In this accident, it is highly probable that when the Aircraft rejected the landing after touching Runway 27, its nose was raised sharply, causing the lower part of the rear fuselage to contact with the runway and be damaged. Balanced pitching moment was disrupted by the captain’s nose-up elevator input as his go-around was initiated from the full-aft sidestick position.